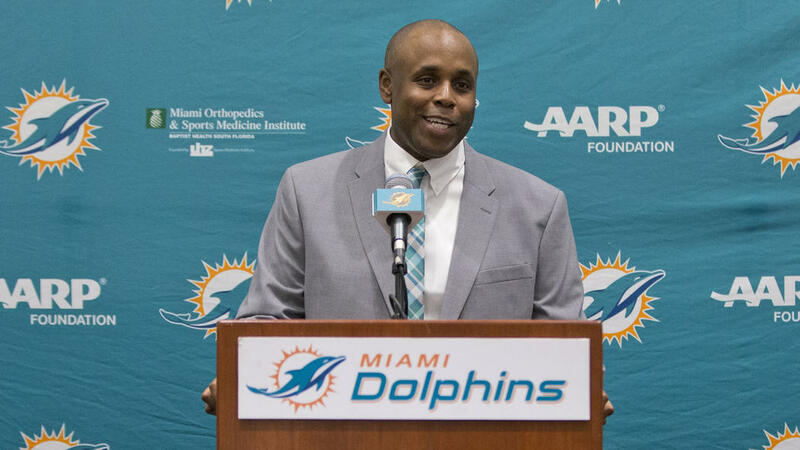 DAVIE – The first step in the Miami Dolphins’ latest round of offseason changes was settled quickly Monday, when Chris Grier’s promotion to general manager was finalized. His first task: Help the Dolphins find a coach. With Grier in place, the biggest order of Dolphins’ offseason business, finding a coach, can now get under way. Super Bowl winner Mike Shanahan will interview Tuesday for the job, Chicago offensive coordinator Adam Gase is expected to be a top candidate and many players are clamoring for interim coach Dan Campbell to be back. Grier just completed his 16th season with the Dolphins, the past nine of those as their director of college scouting. 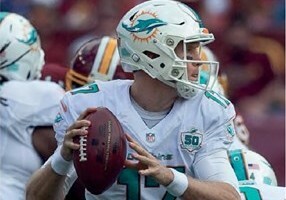 The Dolphins won a playoff game in his first year with the team, and haven’t had a single postseason victory since. They went 6-10 this season, finishing last in the AFC East and falling well short of the team’s expectations. 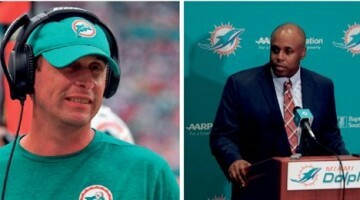 “We need to take a long, honest sober view of what needs to be fixed,” said Dolphins executive vice president of football operations Mike Tannenbaum, who will oversee the coaching search and make a recommendation to owner Stephen Ross on who to ultimately hire. Tannenbaum will also oversee Grier, the replacement for Dennis Hickey, whose two-year stint as GM ended Saturday night. Grier will be part of the small group involved in interviewing coaching candidates. It’s not just a coaching move that needs to happen. Going 1-5 in the AFC East and with a penchant for starting slow in most games, the Dolphins know there’s plenty of areas that need upgrading on the field. So when players packed up their belongings Monday, many were doing it at the Dolphins’ facility for the final time. They stuffed shirts and shoes in clear plastic bags, handed in playbooks and iPads and filled out the team’s postseason surveys, among the questions, why they thought a roster with so much talent couldn’t make the playoffs, Monday morning. Some players met with Campbell, before starting an offseason vacation that came way too early for the Dolphins’ liking. Grier started with the Dolphins in 2000 as a scout, the same role he had for five seasons with the New England Patriots before coming to Miami. The Dolphins promoted him to national scout in 2003. He’s the brother of former NHL player Mike Grier and the son of longtime NFL executive Bobby Grier. When the Patriots let his father go in 2000, they also allowed Grier to pursue other opportunities, which led him to Miami. Grier has had interest from other GM-seeking clubs in the past, the New York Jets and Philadelphia Eagles among them. And he’s not exactly inheriting an easy job in Miami. “We will earn your trust back, both on and off the field,” Grier said. The Dolphins are one of only six teams who haven’t won a playoff game in the past 15 seasons, a list that includes Kansas City and Cincinnati, two clubs that are in this year’s postseason field and have a chance to end their droughts. Other than the Chiefs, Bengals and Dolphins, the other three teams who have gone without playoff wins in that span are Buffalo, Detroit and Cleveland. Miami hasn’t even made the playoffs since 2008, and Tannenbaum acknowledged he feels daily pressure for the Dolphins to finally get things right. “I gave up everything to come down here,” Tannenbaum said. “I’ve been to three championship games. It’s really not about me, but I came here to win a championship. I’ve accomplished everything in my career except get a ring.